Are you trying to get a handle on the wide variety of storage options available in Microsoft’s cloud services and platforms? Do you need to determine the best combination of Azure storage services for your app or storage scenario? Understand the use of Azure storage services (files, blobs, queues, tables) to create your own storage solution or apps from scratch. Incorporate Azure storage services—such as Azure DocumentDB, Azure Redis Cache and StorSimple—as a starting point for your storage solution with additional configuration or coding for a custom fit. Determine the storage facilities of ready-to-use Azure storage services—such as Azure Site Recovery and Azure Backup—and those for Office 365, Microsoft Dynamics CRM Online and Microsoft Intune. The grid format allows you to easily locate the set of services for a specific storage scenario, such as managing data or backing up files. You can download this multi-page poster as a PDF or Visio file or view it in a new easy-to-browse format. You can also print the pages of this poster on tabloid format paper (also known as 11x17, ledger or A3). 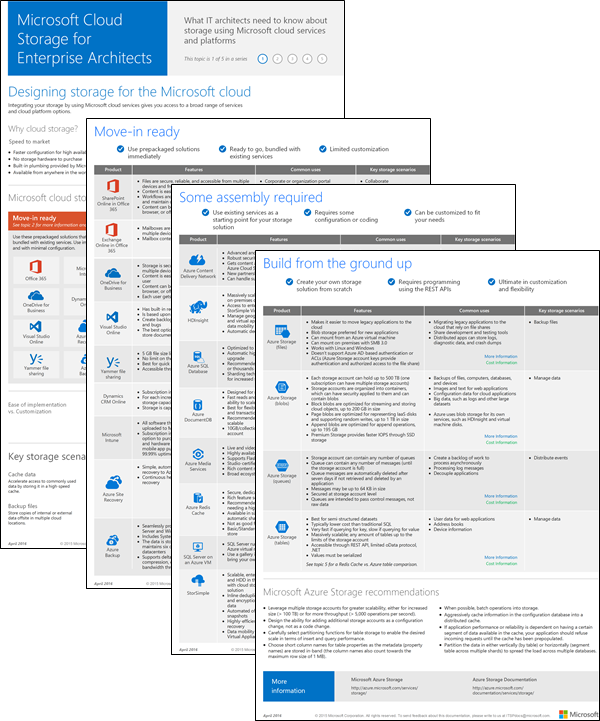 Check out the other posters in the Microsoft Cloud for Enterprise Architects Series.